If you install the server on a raised floor and you provide underfloor cooling, install perforated tiles in front of the server to cool it. 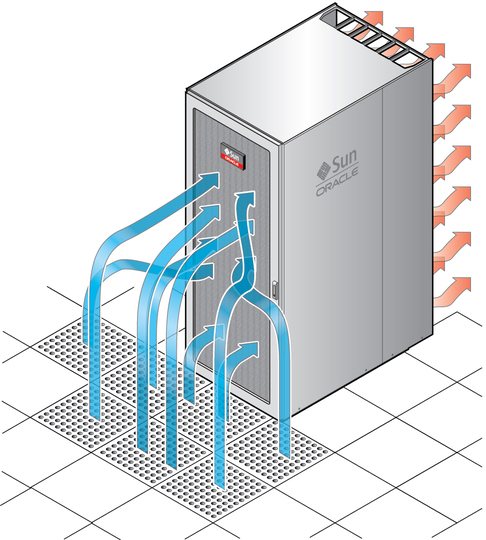 The following illustration shows an example arrangement of seven perforated floor tiles providing cooling air to the server. In this example, each perforated tile provides 600 CFM of cooling air in order to provide the 4200 CFM maximum total cooling airflow. If your perforated floor tiles provide cooling air greater than 600 CFM, you can use fewer tiles to cool the server. For example, if the perforated floor tiles produce 700 CFM of cooling air, install six floor tiles in front of the server. Note - The exact arrangement of these floor tiles depends on the space available in front of your server. Contact your facility manager for information about the proper arrangement of these tiles for your facility.